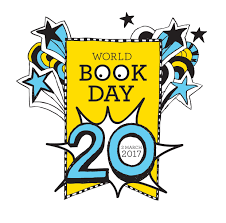 World Book Day 2017 – Thursday 2nd March World Book Day is fast approaching! This year’s celebrations are taking place on 2nd March and Marlborough St Mary’s are planning a host of activities throughout the day to celebrate. We would love for the children to come to school dressed as any character from a favourite story! Maybe they could work with a small group of friends to dress up as several characters from one story. Alternatively they could wear the same costume that they wore for the Enchanted Day. As well as this, one of our activities will be to recognise the importance of reading by immersing ourselves in our favourite books! Periodically, there will be a signal across the school and all children and adults will Drop Everything And Read! We hope to capture some interesting photographs of this extra time for reading! World Book Day celebrates the joy and value of books and reading, especially for children. To help get them started on their reading journey, every child will receive a £1 World Book Day Book Token that can either be exchanged for one of TEN special £1 World Book Day books or used to get £1 off any book costing £2.99 or more. You can find out more about the books at www.worldbookday.com/books.